Sponsorships can be tricky, as you’re investing time, money and effort into a sporting event without any real guarantee of getting any tangible benefits in return. If your business offers stuff or services even remotely related to the athletic world and you’re doing relatively fine, you are likely approached by event coordinators on a fairly regular basis – and you want to pick wisely. At the same time, even picking a potentially brilliant event to promote your services doesn’t guarantee success. You also need to consider successful promotional strategies – many people think setting up a table with a banner and calling it a day is enough, but trust us, it’s not. Today, we’d like to talk about some tips and strategies to help you make the most of the next sporting event you decide to be a proud sponsor of! That’s right – you always need to ask yourself that when event representatives approach you, thinking long (but not too long) and hard before actually confirming your participation. You really want to make sure that the event attendees (both athletes and spectators) will likely be interested in what you have on offer. In other words, choose wisely, not randomly. Is it a popular event? It doesn’t necessarily have to be huge, but it does have to be the match or the race people will actually attend. Amateur events may be a huge hit and miss, but don’t turn those down straight away either – do your research. Is your business relevant to what’s happening and your promotional materials? For example, if you’re using bib clips as the main canvas for your logo, are the athletes actually going to wear them for the event? Can you afford it? Sponsorships are often quite expensive, and it all adds up quickly – merchandise, flyers, banners, promo tables… If you don’t think you can afford well-rounded presence, maybe wait until the next opportunity comes around (and just donate a little bit of money to the team or an event if you really want to support them financially). If your business doesn’t exclusively offer sports related stuff, chances are your typical promo merchandise isn’t strictly sports-related either. This may let you down, as pens, calendars and sticky notes are not exactly your best bet to make a lasting impression on sporting event attendees. Therefore, it makes sense to consider something powerful yet relatively inexpensive to manufacture. In addition, it’s always a good idea to think outside the box and offer something truly unique and super useful (t-shirts and baseball caps, however cute they are, don’t quite cut it, sorry). Fortunately, there are great options out there! For instance, have you heard of BibBoards – unique reusable safety pin replacements? These clever plastic bib clips, which are cost effective, consist of two parts which snap together. The exposed part provides great flat space for a logo – and considering that four bib clips are required for each bib number, that’s a great opportunity to display a logo multiple times per athlete. Your brand will not only be at that event but every event thereafter. They will sure get snapped multiple times by event photographers, giving your business even more exposure. 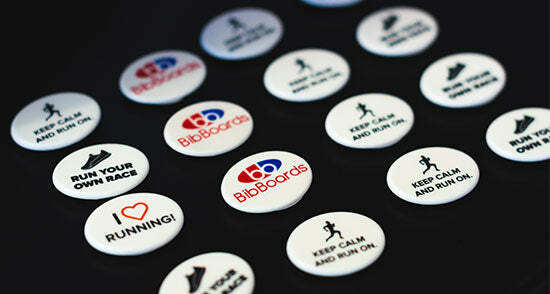 And as BibBoards are reusable, athletes are likely to keep them as souvenirs and attach to their attire over and over again, advertising your company event after the race is over. There will be waiting periods and breaks throughout the sporting event, and those are your ultimate chance to shine and connect with other people. An easy way to approach people and capture their attention is to organise mini-giveaways and prize draws which are free to enter for everyone who “likes” your social media page or subscribes to your email list. Remember, your goal here is not to flash a banner, but to build real, long lasting relationships with prospective customers. So don’t be lazy and really prove you have a lot to offer, including excellent customer service! Which is probably one of the main reasons to carefully consider sponsoring sporting events, athletes or teams. If you select your prospective partners carefully in alignment with your brand values, your company will instantly become much more appealing for their loyal audiences. Unfortunately, it also works the other way around – for instance, it’s a terrible idea for alcoholic or energy drink companies to target family friendly events, whereas for FMCG (fast moving consumer goods) type companies it’s a great choice. By picking the target audience wisely, you will sure attract many new customers passionate about what you offer. Spectators, for instance, want to be a part of the sport they’re watching, so they’ll readily purchase anything linked to that image, including sponsored goods. A good example is skyrocketing sales of S60 Volvo has experienced since their induction to the V8 Supercars. Sports sponsorships are sometimes challenging to get right – but they also tend to be extremely rewarding. Not only you’re supporting amazing athletes by providing such sponsorships, but you’re also potentially getting really good value for money yourself, as well as establishing a positive brand image. By following the tips above and picking the right events and athletes, you will be able to avoid most common rookie mistakes and enjoy the experience.